Writing the post specially to record the anomaly on FKLI, on a parliament dissolution day. Historically, we plunge at least 10% on dissolution rumors...another 10% on dissolution announcement, another minimum of 10% from dissolution day to actual GE date. i.e. -- At least 30% plunge from starting of dissolution rumors, through the Election Day. Well...again, it proves that historical statistics may remains as old as history, & does not necessarily implies that the same scenario MUST repeat itself. Still, we trade what we see, & should never trade on news, the best is to avoid the volatility on an announcement day (economic data, significant biz/politic new, earnings...any kind of market moving announcements) all together. Today saw price traveled a hefty 60+pts range, from my channel top to its bottom, then back at the top by close. I commented in one of the online forums, anyone with a clear mind, without being affected by the dissolution news, could have easily made at least 60-80 points from each of the 60+pts up- & down-swing today. Then, he/she can call the whole April month off, having made an average monthly salary figure within a day's time. Pretty hard to call for a direction tomorrow, after such drastic price action today. Technically, a Dragonfly Doji points to more upside ahead, especially one with such long a tail. A close above the 1,680 level for the first time since Jan'13 also spells bullishness. However, the all-time high 1,705 peak overhead is going to impost great pressure on the price rally. Also, despite a close on higher high, RSI still remained below its resistance level. A break above should occur soon if price is to go further up from here. 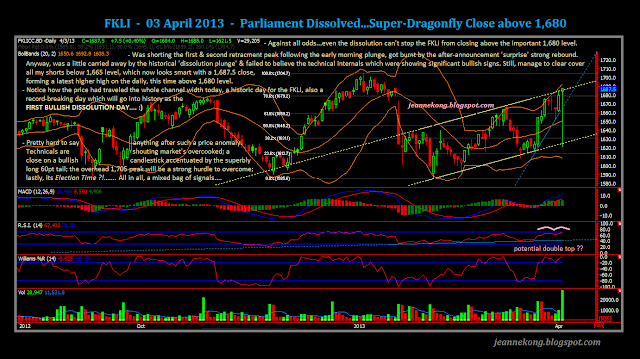 Momentum averted a close below its overbought line thanks to the post-dissolution news strong rebound. Maintain within the overbought region at close, a sign that bulls are still in control. So, I shall keep to intraday play, & stay extra cautious under such chaotic environment. - Election MUST be held within 60days. TheEdge reporting the dissolution announcement & possible dates of upcoming events leading to the Election Day. Useful reference?...maybe useful guide for setting up traps? I believe in preparing for as many possible outcomes as u can think of.